June 21 — St. Aloysius Gonzaga, Religious - Memorial - My Catholic Life! The Jesuit Order, from its very founding, had a sharp sense of its educational superiority, its fidelity to the Holy Father, and its mission to educate and spiritually guide the elites among the courts and aristocracies of Europe. The Order did not, however, develop a strong community identity. There were, and are, common houses. But Jesuit communities built on common prayer, meals, and apostolates were rare. Much more common was the Jesuit alone, among the trees of a Canadian forest, in a boat riding the waves, like a cork, off the coast of India, or trekking the narrow mountain pathways in the mist of the high Andes. Where there was one Jesuit, there was all Jesuits. Each man embodied his entire Order. It was a community of many ones. Jesuits were united by their vows, their long education, and their common mission. Actually living, praying, eating, relaxing, and working together, so crucial to the common life of other Orders, did not play an equivalent role among the Jesuits. Jesuit superiors were aware of the dangers that isolation might pose to unity. So they encouraged, and even mandated, a means to sew into one fabric the patches of a thousand lives being lived across the globe. Letters! Jesuits were required to write letters to their superiors giving regular accounts of their work. These letters had to be detailed, instructive, and inspiring. After they were reviewed, the most edifying were published and distributed to Jesuit houses. Through these letters the Order was made one. Every Jesuit knew what at least some of his brothers were doing for God and the Church. These collections of letters, known as the Jesuit Relations, were eventually distributed beyond the confines of the Order. By the seventeenth and eighteenth centuries, the Relations were often exciting best sellers recounting the apostolic exploits of isolated Jesuits walking along the rim of Christendom. It was just such an inspiring letter, or relation, from India that inspired today’s saint, Aloysius Gonzaga, to become a Jesuit. Saint Aloysius was known to his family as Luigi, Aloysius being the Latinized version of his baptismal name. He was the eldest of seven children born into an aristocratic family from Northern Italy. Kings and Queens and Cardinals and Princes ate at the family table, were family themselves, or were at least friends or acquaintances. Young Luigi knew, and detested, the frivolous existence lived by so many in his aristocratic milieux. He also suffered from various physical infirmities which produced that vulnerability and perspective which leads so clearly and directly to a deep dependence on God. 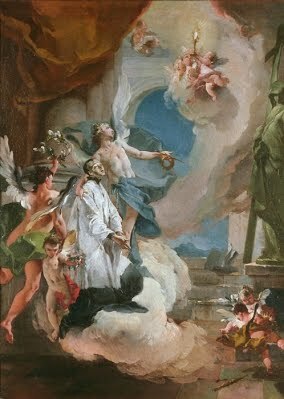 After receiving his First Communion at about the age of twelve he came to personally know the great saint Cardinal Charles Borromeo, who would later be his confessor and spiritual director. Borromeo was a Jesuit. His example, together with Aloysius’ reading about the works of Jesuit missionaries, convinced him to enter the Jesuit Novitiate, against his family’s wishes. So Aloysius went to Rome to begin his studies. And there he grew to embrace those of lesser education and refinement than himself. He volunteered to work bringing victims of a plague to a Jesuit hospital, despite his personal revulsion at the patients’ decrepit physical conditions. After his own physical limitations limited his participation in this corporal work of mercy, he still persevered and insisted on returning to the hospital over his superiors’ objections. While working in the hospital, Aloysius contracted the plague from a patient he personally care for, was incapacitated shortly thereafter, and, a few months later, died on June 21, 1591. He was twenty-three. His reputation for purity, prayerfulness, and suffering led many to consider him a saint soon after his death. Aloysius was beatified just fourteen years later, in 1605, and canonized in 1726. He is buried in the Church of Saint Ignatius of Loyola in Rome. Saint Aloysius is the patron saint of all Christian youth and plague victims. St. Aloysius, you laid all your treasures, including your youth, on an altar to God. May your example of generosity, and your service to the sick and dying, inspire all Catholic youth to give God the gold of their early years, not just the silver of middle age or the bronze of their retirement. ALOYSIUS, the eldest son of Ferdinand Gonzaga, Marquis of Castiglione, was born on the 9th of March, 1568. The first words he pronounced were the holy names of Jesus and Mary. When he was nine years of age he made a vow of perpetual virginity, and by a special grace was ever exempted from temptations against purity. He received his first Communion at the hands of St. Charles Borromeo. At an early age he resolved to leave the world, and in a vision was directed by our blessed Lady to join the Society of Jesus. The Saint’s mother rejoiced on learning his determination to become a religious, but his father for three years refused his consent. At length St. Aloysius obtained permission to enter the novitiate on the 25th of November, 1585. He took his vows after two years, and went through the ordinary course of philosophy and theology. He was wont to say he doubted whether without penance grace would continue to make head against nature, which, when not afflicted and chastised, tends gradually to relapse into its old state, losing the habit of suffering acquired by the labor of years. “I am a crooked piece of iron,” he said, “and am come into religion to be made straight by the hammer of mortification and penance.” During his last year of theology a malignant fever broke out in Rome; the Saint offered himself for the service of the sick, and he was accepted for the dangerous duty. Several of the brothers caught the fever, and Aloysius was of the number. He was brought to the point of death, but recovered, only to fall, however, into slow fever, which carried him off after three months. He died, repeating the Holy Name, a little after midnight between the 20th and 21st of June, on the octave-day of Corpus Christi, being rather more than twenty-three years of age. Reflection.— Cardinal Bellarmine, the Saint’s confessor, testified that he had never mortally offended God. Yet he chastised his body rigorously, rose at night to pray, and shed many tears for his sins. Pray that, not having followed his innocence, you may yet imitate his penance.